CoolSculpting® is a non-invasive fat-reduction procedure that can help patients improve targeted areas by 20% within a 3-6 month period. The treatment requires no anesthesia and is best for people who want to tighten the contour of trouble-spots around the body. Dr. Kaweski offers CoolSculpting to her San Diego patients because of its proven efficacy and comfort and because it requires no downtime. If you are considering liposuction to address a small-to-moderate amount of fat in an accessible, “pinchable” area, and if you prefer to avoid general anesthesia for your treatment, you may be a good candidate. Unwanted fat in the thighs and hips. Bulges around the midsection and belly. Excess fat around the arms. During your initial consultation, Dr. Kaweski will talk with you about your goals, conduct an examination, and evaluate your needs. If CoolSculpting is a good option for you, she will explain the procedure and the benefits and disadvantages it offers compared to traditional liposuction. Like liposuction, CoolSculpting provides San Diego patients targeted improvement. It is not a weight-loss procedure, so if your goal is extensive reduction throughout your body, you may be better suited to a different procedure. However, if you have an area that you want to smooth or tighten, CoolSculpting can be a great solution, and unlike liposuction, you won’t require anesthesia or downtime. As part of your examination, Dr. Kaweski will discuss how much fat she thinks treatment can remove, how many applications you may require, and how long it may take to see the full results. San Diego patients receive CoolSculpting treatments in-office. Before the procedure, the areas that will be treated will be marked. These will be the same areas that Dr. Kaweski will have noted and photographed during your initial consultation. You will rest on a treatment table, and will be provided pillows and blankets to keep you comfortable. The CoolSculpting device will gently pull the “pinchable area” between its two treatment plates. A disposable liner and/or a skin-protecting gel pad will be between your skin and the applicator. The plates will apply very cold temperatures to the surface of the skin for about 30-40 minutes. The effects of treatment will not harm normal tissue—only fat cells. 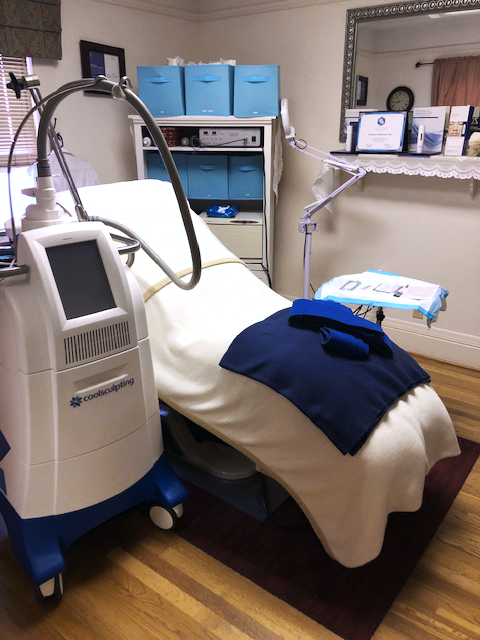 Since skin numbs rapidly, most San Diego patients don’t feel any sensation after the first minute or two of CoolSculpting. You can read, drink, and otherwise relax while the treatment does its work. After the cold application, you will receive a brief massage in the targeted area, which research suggests will help accelerate fat loss in the early healing period. Since fat tends to create symmetrical trouble spots on the left and right side of your body, you will likely require at least two applications: one for each side. Dr. Kaweski can treat up to four areas in a single visit (one after the other). Beyond this point, she may discuss multiple visits or liposuction as a solution for you. Following your treatment, you may experience numbness, tingling, and achiness for about two weeks in the targeted areas. Dr. Kaweski recommends a follow-up visit at two weeks to ensure that you are feeling no residual discomfort after this point, but it is unlikely that any visible results will be seen this early. You should be able to manage symptoms with Tylenol or ibuprofen. Most people don’t require prescription pain medication, ice, or topical treatment, and unlike liposuction, you won’t need to wear a support garment, recover from anesthesia, or heal from stitches. Expect to return to work or normal activities on the same day as the procedure. San Diego CoolSculpting patients usually require only one visit to get a 20% reduction of fat in the treated areas. Full results take 3-6 months to see because your body needs time to close down dying fat cells. If after this period you would like to reduce fat in the area further, Dr. Kaweski can provide a second treatment. Typically, a follow-up session will show half as much improvement as the first. See firmer, tighter, and more toned features with CoolSculpting. Call (619) 464-9876 today to schedule an appointment with Dr. Kaweski at The Aesthetic Arts Institute of Plastic Surgery, located in the San Diego area.